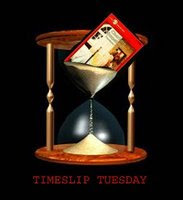 Welcome to the second edition of Timeslip Tuesday, a day on which I look at books whose characters travel through time, and invite other bloggers to do the same (please leave a link in the comments for me to put in the post!). Today's book is London Calling, by Edward Bloor (Alfred A. Knopf, 2006, 289pp). John Martin Conway has spent seventh grade at All Souls Preparatory, New Jersey, in a state of depression. At the school on an employee scholarship (his mom's a secretary), his grades are mediocre, and his only friends two other outcasts. All three live in fear of the school bully, Hank Lowrey IV, whose great grandfather, a general in World War II, left the school a generous endowment. After school ends, he retreats to his basement bedroom, rarely coming out. When his grandmother dies, she leaves him the radio his grandfather had brought home from England in 1941, and Martin begins leaving it on as a nightlight, and its tuner, set between stations, as soothing background noise. Then the first dream comes. "A boy--small, thin, dressed in mud-brown clothes--leaned out from behind the radio and whispered, "Johnny, will you help me?" And so Martin begins a strange life of travelling through time to WW II London, where the blitz is raging and Jimmy's world has become one of deadly chaos. Jimmy can't tell Martin what help he needs--instead, Martin must live through a hellish part of London's past until he sees for himself. The scene around me was horrifying. The bombers had wreaked massive destruction , and the bombs were continuing to fall. Between the shattering bursts of the explosions, I could hear voices crying out in the dark, in pain and terror." Trying to figure out if the people and places he sees in the past are real, Martin spends the present doing historical research, that incidentally changes received wisdom about General Lowrey. But to find out what help Jimmy needs, he must keep going back in time, until the pieces of the past fall into place. And then he must travel to England himself to bring news from the past to one who lived through it. This is classic timesliping at its best. There are no science fiction contrivances, simply the unexplained power of the radio that calls Martin back in time. The mysterious boy from the past with his plea for help leads Martin deeper and deeper into a quest for answers. The clues that Martin learns from his visits to WW II London and his discoveries in the present combine beautifully, and as an added bonus to the story, Martin's quest to help gives him a sense of purpose that draws him out of the basement into better relationships with his family. There's such a lot going on in this book that I glossed over large bits of it. Here are some other reviews that bring up other points -- at Bewildering Stories, at Blog Critic Magazine, and at Kittenpie Reads Kidlit. And coincidentally, five hours before I wrote this, Colleen Mondor blogged at Guys Lit Wire about books with strong and heroic boy characters, and included London Calling. Indeed, one of the strengths of this book is Martin's metamorphosis from depressed basement dweller to strong and purposeful hero, who seeks to fulfill his obligation to Jimmy no matter what. The fact that he largely accomplishes this through dogged historical research, as opposed to whacking bad guys, makes the book even more appealing in my eyes. Liz from A Chair, a Fireplace, and a Tea Cozy is in with a look at King of Shadows, by Susan Cooper. Lisa from Under the Covers is in with a new one for me-- Ghost Letters, by Stephen Alter.